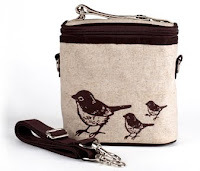 We love our Brown Bird Lunch Cooler Bag from Canadian company So Young Mother. Apparently, so do many of you - we have a hard time keeping it in stock. Now we find out it's a favourite of the Hollywood set too. 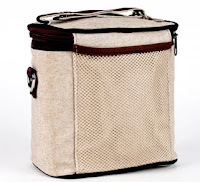 Oscar winning actress Halle Berry was spotted carrying this same Birds Cooler Bag with her daughter Nahla in tow. It's no wonder. 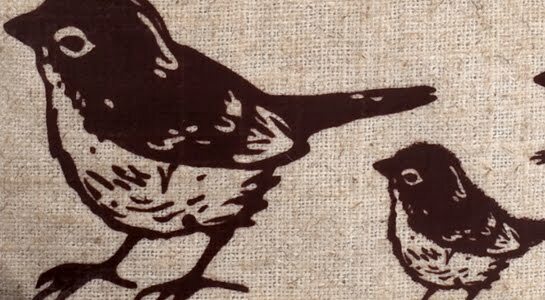 Not only is this bag free of nasties like PVC, lead and phthalates, but it's insulated, easy to clean and made with natural linen. The carry handle is adjustable so you can strap it to a stroller or another bag and it comes with detachable shoulder straps so you can always sling it over one or both shoulders and carry it on your back. The bird graphics are gorgeous and the zipper opens on three sides for easy packing plus there's an ID card inside and an exterior mesh pocket on back. Above all else, our absolute favourite thing about this cooler lunch bag is its upright style that allows for stacking containers or standing bottles upright. It's a great option for back to school or work lunches. For more details, click here.